Just four days before, Charlie decided she wanted to have an Indian wedding to mark the occasion of our first anniversary. 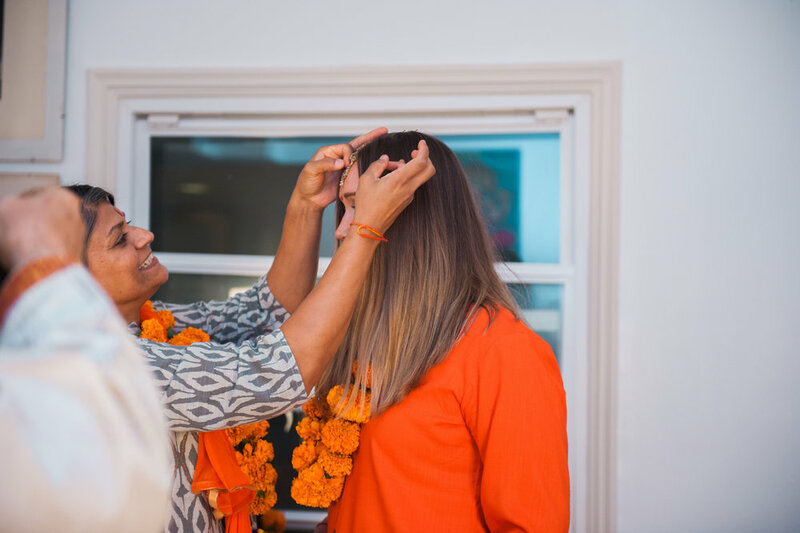 We found the only Hindu priest in L.A. who would tie a gay couple, designed an invitation, and bought all the marigolds we could find. We even lucked out when our friend Peyton, of Paint the Sun Photography, happened to be in town and agreed to document the occasion. Did I mention we also worked our full time jobs in between putting it all together? Charlie wanted the day to include as much of her upbringing as possible. She started prepping the food Friday night and didn't stop cooking until just minutes before the ceremony started the following day. She had me design and build a phira, put the flower arrangements together, and turn our living room into a mandap where the ceremony could take place. Since we didn't have a huge budget, I found items around the house to repurpose. We covered the ground in white table cloths, sat on cushions and pillows from the nook in our kitchen, and used decorations from our 2016 wedding in Big Sur. We scattered marigolds everywhere, including the steps leading up to the entrance of our home. The evening of the ceremony, we were surrounded by a very intimate group of family and friends who helped us tie our lives together in a beautiful celebration. We felt so much love and happiness when we were showered with rice and rose petals at the end of it all. We finished the night eating the feast my wife had prepared for us. Three curries, roti, rice pudding, and the fruits and desserts used in the ceremony. It was the perfect way to celebrate our love and our first anniversary together.